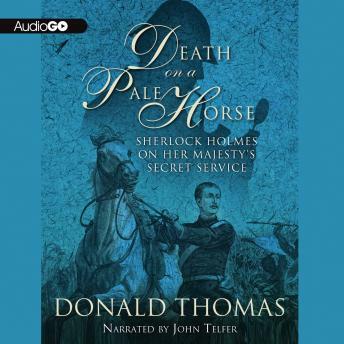 In a momentous period of British history, Donald Thomas’ latest Sherlock Holmes adventure pits the great detective and his faithful biographer, Dr. John Watson, against an international conspiracy led by a disgraced English officer. Colonel Hunter Moran bears upon him the “Mark of the Beast”; his satanic ingenuity leaves a spectacular trail of devastation. It runs from the annihilation of a British armored column by Zulu tribesmen—armed only with shields and spears—to a life-and-death struggle on the sinking passenger steamer Comtesse de Flandre. The heir to the French empire lies dead in the African dust. Europe is brought to the brink of war by forged dispatches, designed to enrich gun-runners and assassins. The gold fields and diamond mines of South Africa become the playground of organized crime. Only the detective genius of Holmes can prove a match for the unfolding criminality of Moran and his associates. With Watson and Mycroft at his side, Sherlock Holmes again demonstrates that although the powers of the state and the underworld may try to overpower him, they will never out-think his splendid analytical mind at the height of its powers.